Major crisis, both global and personal, can be very unsettling for you and your child. Traumatic events shake the world that we considered safe and predictable. Such events also create a high level of confusion, apprehension and fear. Discussion on the news and in our community can add to that anxiety. Maintain a sense of calm. Crisis, disaster and loss can have a profound effect on children. Explain the situation the best you can. Situations which are not easily understood cause the greatest fear. Information helps to normalize the event. Take your child’s fears seriously. A child who is afraid is truly afraid; it doesn’t have to make sense. Don’t say “It’s silly to be afraid.” Rather, say “I can see you are afraid,” or “It’s a scary feeling when you think you are alone.” Being told that it is normal to feel afraid is reassuring to a child. Be a good listener. Remain calm. Speak quietly and gently. Listen with both your ears and your eyes. Look for nonverbal clues that show how the person is feeling and report what you see. Encourage communication. For example, say “You seem sad,” then wait for a response. Share your feelings. While it is important to demonstrate strength and control, it will not harm children to let them know that you experience fear. Show that you care. Spend some extra time with your child. Ensure your child that you are always available to talk about things that may be troubling him / her. 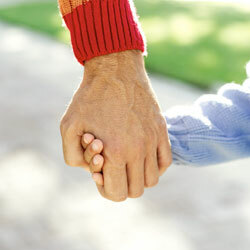 Use a warm expression and physical contact to reassure your child that you care. Return to regular family routines as soon as possible. Familiar routines are comforting for a child.